Just How Far Can The Limits Be Pushed? 3D printing makes production faster, cuts costs and is capable of producing lighter weight and stronger parts. 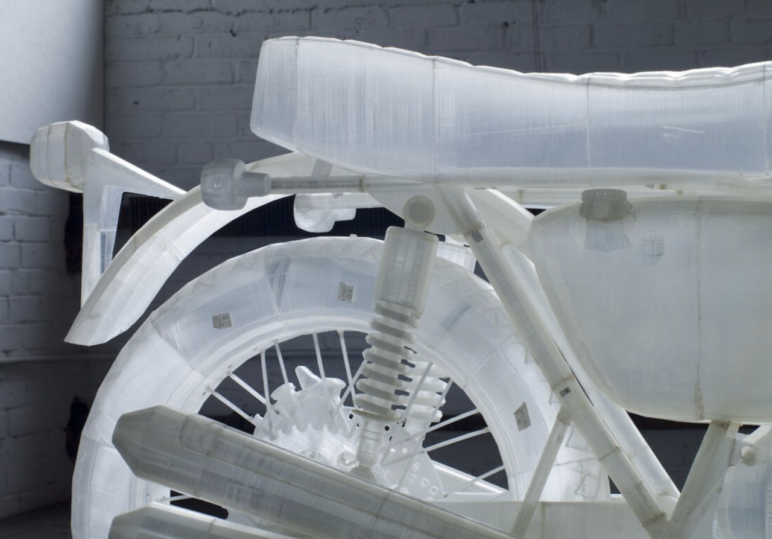 Take a look at some of the world's most impressive 3D printed motorcycle projects! 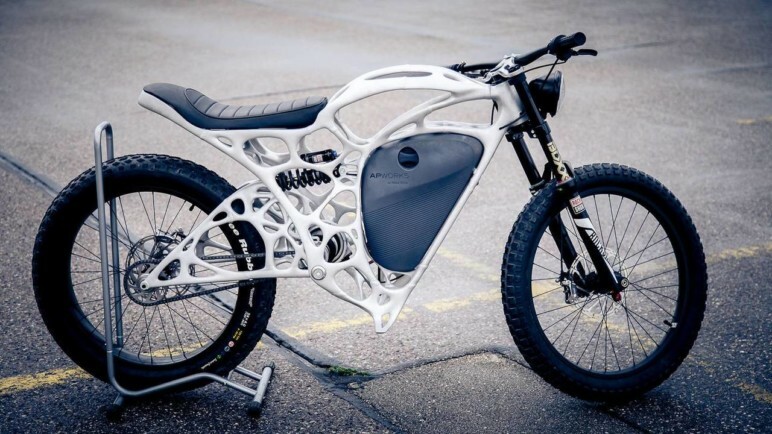 Most Promising 3D Printed Motorcycle Projects Just How Far Can The Limits Be Pushed? It’s always fun and interesting to see just how far 3D printing can be pushed. In the past few years, quite a few 3D printed car projects were launched, showcasing 3D printing’s potential in large-scale manufacturing. The story is more or less the same with motorcycles. There’s a huge potential for 3D printing in the automotive industry because the technology makes everything from development to production happen faster, cheaper and more efficiently. Just to be clear, 3D printing motorcycles refers to 3D printing the motorcycle’s body. The engine or e-motor can’t be 3D printed — not yet anyway. As with 3D printed cars, 3D printed motorcycles still mostly exist in the form of prototypes, or they’re made in limited numbers making them quite expensive and unique. Additionally, 3D printed motorcycles still aren’t around in mass numbers; projects like the ones we present here mostly raise awareness around what could be the future of motorcycles. 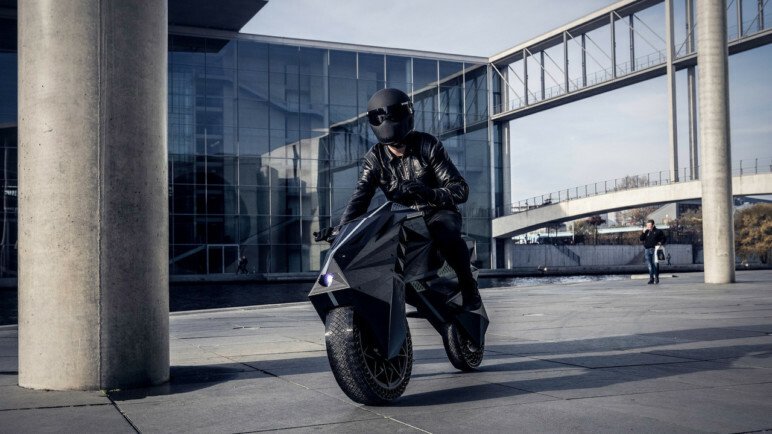 German large-scale additive manufacturing firm BigRep decided to create a 3D printed motorcycle to show off the capabilities of its 3D printers and materials: The NERA motorcycle is an FDM 3D printed electric motorcycle, created by NOWlab, BigRep’s innovation division. The main goal of the entire 3D printed motorcycle was to display the company’s ability to implement new technologies and materials into production. In other words, BigRep wants the NERA to represent the new era in large-scale additive manufacturing, hence the name. 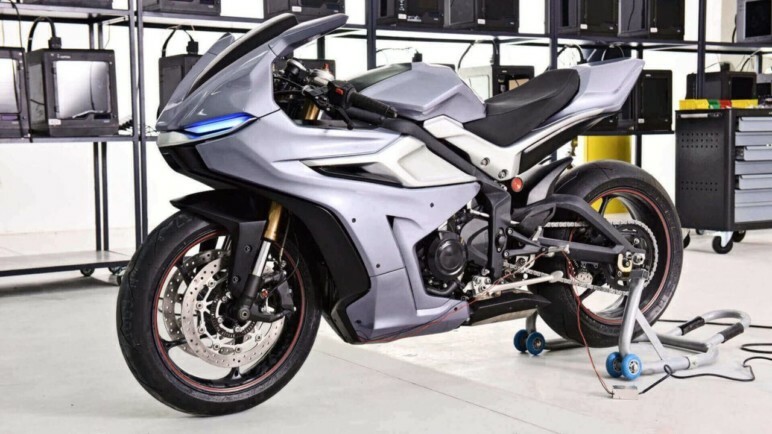 Showcasing 3D printing on big scale projects like the NERA motorcycle should highlight the technology’s ability to reduce both lead times and costs but, at the same time, reduce the dependency on supplier networks. BigRep claims the production time, from conception to final product was around 12 weeks. That’s fast! Also, the engineers designed the NERA so that it contains only 15 parts so that both assembly and production could be faster and easier. The e-motor that powers the NERA is mounted in the back rim, while the battery powering it sits inside the entirely 3D printed bodywork. Even the tires are 3D printed! They’re made of a unique structure, which makes them airless and much harder to puncture. What you may have noticed looking at the NERA is the lack of a conventional fork. That’s because the NERA features a forkless steering system made out of eight pivot joints. And to remove the need for suspension, the NERA features 3D printed flexible bumpers, which should absorb all kinds of road bumps. Polish 3D printing company Zortrax decided to 3D print all of the plastic exterior components of a Triumph Daytona motorcycle. The designers came up with a new design for the bike’s exterior plastic components, casting around the tank, seat, windshield, fairings and lights. The process of redesigning the bike began by stripping all of the bike’s surface components. Afterward, the team used 3D scanners to accurately scan and redesign every component so that the new parts would fit just as well as the OEM parts. All of the new, redesigned parts were made on Zortrax’s M300 FDM 3D printers. Obviously, in order to achieve a smooth surface finish, the parts had to go through a range of post-processing methods, including sanding, grinding, and painting. Redesigning the motorcycle took a month, which is a notable achievement. What this project brilliantly shows is the potential 3D printing and scanning technologies have for aftermarket body kit manufacturers. Using 3D printing and scanning, it’s possible to design and produce an entirely new, perfectly fitting bodywork in a matter of months! Sadly, the Zortrax-modified Triumph Daytona isn’t road legal since it features lots of 3D printed components that haven’t been approved for road use. The Light Rider is considered the world’s first 3D printed motorcycle. It was developed by APWorks, Airbus’s division for metal additive manufacturing and advanced materials. The most noticeable feature of the Light Rider is the design of its frame. It was produced using specific bionic algorithms, which produce shapes that take the least amount of material but provide the greatest level of strength possible. That’s why the frame looks so exotic. The frame weighs just 13 lbs (6 kg) and was made on a metal 3D printer through metal powder bed fusion. APWorks used its proprietary material called Scalmalloy. Think of it as a unique material that combines aluminum’s lightweight features with titanium’s strength. In fact, APWorks claims its “Scalmalloy” is even stronger than titanium! Thanks to the frame, the entire motorcycle weighs only 77 lbs (35 kg) and is powered by a 6-kW electric motor. The Light Rider has a claimed top speed of 50 mph (80 km/h). The Light Rider is road legal and available for purchase. However, it comes at the high price tag of $56,000 and only 50 units will ever be produced. 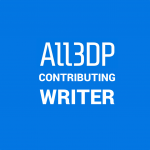 While APWorks definitely made a few bucks selling the Light Rider, the company also gained new knowledge in the field of additive manufacturing. The APWorks team successfully showed the world that it’s possible to make a robust vehicle with metal additive manufacturing. The main goal is to implement the techniques used for the Light Rider’s production into the aerospace industry. Last year in Mallorca, BMW Group held the “Digital Day” event where the company showcased its visions for future implementations of advanced new technologies into production and vehicles themselves. 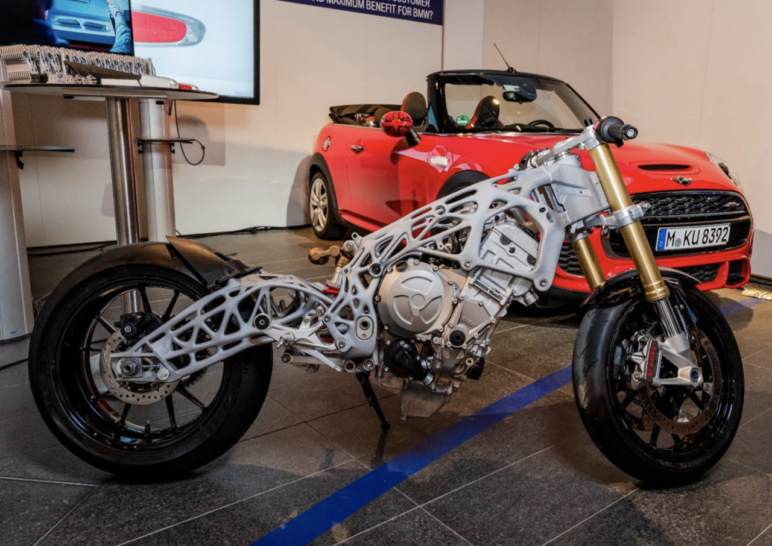 The eye-catching exhibit was the 3D printed motorcycle frame and swingarm. Sadly, we don’t know what they’re made of, but what we guess it was 3D printed using metal powder bed fusion. The 3D printed frame belongs to BMW’s 200hp S1000RR motorcycle. The S1000RR is a very successful motorcycle, which started its life in the form of a 2009 Superbike World Championship motorcycle. A year later, a series production version of the S1000RR was revealed. BMW is one of the automotive industry leaders when it comes to additive manufacturing. The company has already invested over $11.3 million into additive manufacturing, meaning it has a huge interest in it. BMW is well aware that 3D printing could be the ultimate solution for faster and cheaper production. Also, when it comes to motorcycles, weight is especially important. The less the motorcycle weighs, the better the performance figures are. 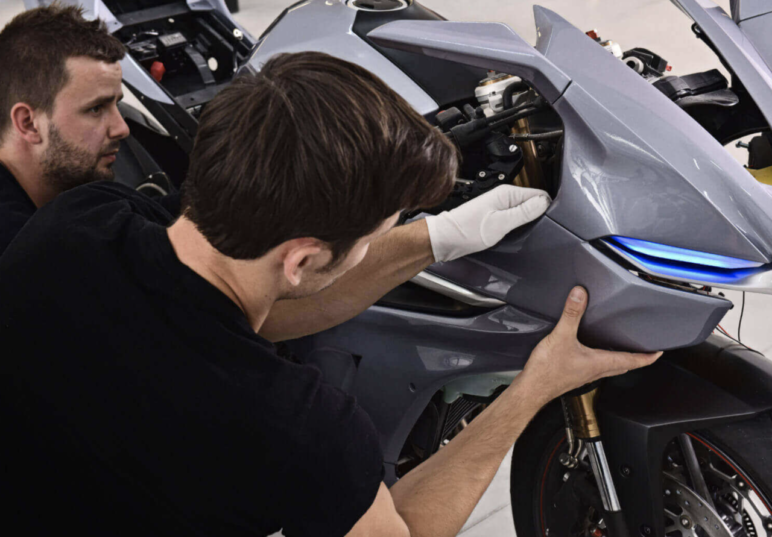 With 3D printing, BMW aims to 3D print motorcycle frames which reduce weight but, at the same time, provide a great amount of structural strength. Although the 1:1 scale 3D printed Honda CB500 from 1972 isn’t a functional 3D printed motorcycle, it’s too cool to ignore! It’s almost hard to believe that New-York-based artist Jonathan Brand created this amazing full-size replica using only two Ultimaker 3D printers. Given his desire and passion for motorcycles, Jonathan decided to embark on the journey of 3D printing the Honda CB500. It took him 12 months to fully print the parts out of 18 rolls of transparent plastic filament. Each of the parts measures 1 mm in thickness. Since the replica was done on a 1:1 scale, Jonathan had to split some of the parts, like the seat, into multiple pieces to fit into the printer’s build volume. The final product weighs only 20 kg (44 lbs). Naturally, it’s rather fragile, which means you won’t be able to ride it, but at least the wheels can move. This project showcases the importance and potential of desktop (FDM) 3D printers. 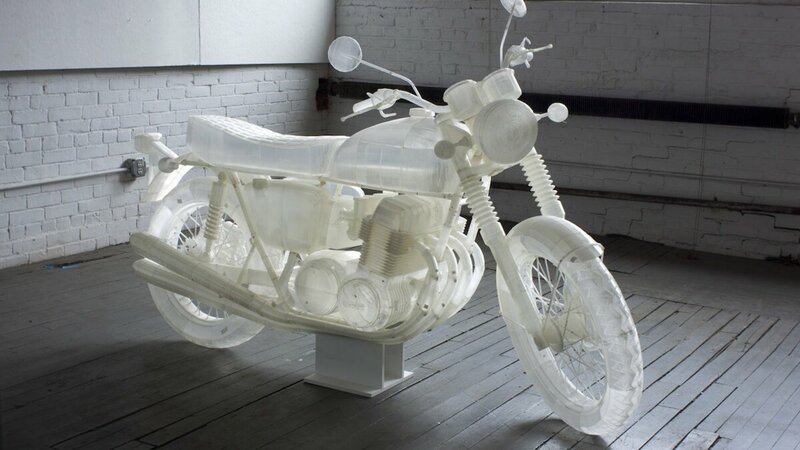 At the same time, it highlights the phenomenal engineering of a motorcycle by the use of a transparent filament. License: The text of "3D Printed Motorcycle – 5 Most Promising Projects" by All3DP is licensed under a Creative Commons Attribution 4.0 International License.